In the framework of the project “Ecosystem-based Adaptation for Smallholder Subsistence and Coffee Farming Communities in Central America” (The CASCADE Project) of CATIE (Tropical Agronomic Research and Teaching Center) and Conservation International have published a series of Training materials for extension technicians from Costa Rica, Honduras and Guatemala, to disseminate practical information on the concept of ecosystem-based adaptation. Climate, climate change, vulnerability and actions against climate change: basic concepts ", aimed at strengthening the knowledge of extension agents on climate change, forecasts and expected impacts in the region. Impacts of climate change on Central American agriculture, mitigation and adaptation strategies, where they present and propose mitigation and adaptation actions in agriculture in the face of climate change. EfD-CA researcher Bárbara Viguera, coordinator of the CASCADA, states that these materials will train more than 150 technicians in climate change and adaptation based on ecosystems. 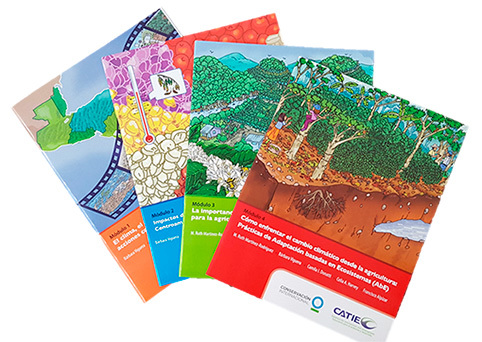 "These teaching materials serve as a basis for the implementation of capacity-building workshops for technicians that the project has developed in Guatemala, Honduras and Costa Rica," explained Viguera. To date, four workshops have been held in Guatemala and Honduras, attended by 99 technicians from 36 organizations in both countries, and two more are expected in the coming months. For its part, in Costa Rica, the project has collaborated in capacity-building activities for Costa Rican technicians in the coffee sector in the NAMA-cafe framework, reinforcing the concepts of climate change, the role of ecosystem services for the cultivation and adaptation of production systems to climate change.